So I uploaded two pics...kinda random, they don't really go together. But one is a Bright Fuscia eye and the other is a smokey eye. I used all pigments for my color on the Bright Fuscia...I think I used pinked mauve, quick frost, and bright fuscia pigment. It's tough for me to get used to using pigments because the texture is different. When I foil them as well to intensify the color I find it hard to blend afterward. Any tips? 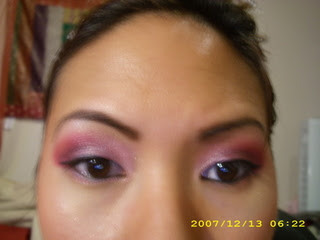 The next look is from my new makeup I got from camera ready cosmetics. I love all the professional grade makeup. You can really tell the difference with these brands...one light tap on the blush and eyeshadow gives you soooooooo much color. I used the foundation from my foundation palette. I think the color I picked was a decent match but there's probably another one I could have chosen to be closer. I also used a darker foundation shade to contour my nose. Then I used my lipstick palette and picked out a light pink that I lined with MAC beurre lipliner. I would have taken more pics but decided instead to spend some quality time with the BF. Even though we practically live together...we've both been super busy. So he decided to forfeit a meeting he had with one of his music friends and I abandoned my smokey tutorial I was going to do so we could just chillax. Tonight, I'm going to work on that red lip video, I promise!